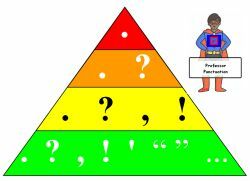 The Writing Bug: "P" Punctuation!?. Over the many eons humans have trudged across this planet there have been numerous debate topics that have never been resolved. Did the chicken or the egg come first? Did the Big Bang or a higher power create the universe? Is the thing on Donald Trump's head truly his hair or a recycled Davy Crockett coonskin cap? Out of all of these back and forth discussions none come close to the ongoing and infinitely frustrating debate on punctuation. Visit any critique group, author coffee, or writers conference and you would be shocked at the amount of fist fights that break out when someone brings up a colon versus an em dash. They say World War I was started due to an assassination? I heard it was due to an argument whether to use a comma or semicolon. Name the punctuation and there's bound to be a debate about it. No wonder many famous authors decided for forgo all punctuation in their writing. They didn't want a riot. Well, I say enough. Is. Enough! Time for a ... what do you call it ... solution to this, and other, punctuation problems. Don't you think? Now, let me clarify. There are some punctuation marks that should be used on a regular basis. For instance, periods for normal statements, questions marks for interrogative statements. Exclamation points can be used only if someone bangs their thumb with a hammer or has to shout to everyone about an incoming meteor about to crash in the middle of Boise. If your characters are based in New York or New Jersey and swear a good deal then use periods to end statements. Trust me, it's part of their f****in vocabulary. It starts to get dicey when you consider statement separators like commas and semi-colons. Some authors, love to use, commas to, break up sentences. Unfortunately, this makes the narrator or speaker sound like they're constantly out of breath. Others dollop large servings of semicolons; as they feel these are the perfect way to emphasize two separate portions of a sentence; or maybe combine two independent clauses into one. Then there are folks who love the colon: they don't have to use a capital letter to start a new thought. And we won't discuss the em dash -- or the ellipses. We just ... won't. Are there exact rules for punctuation? Well, there are guidelines, but they change faster than Hollywood power couples. Should you wish to get an idea of some of the standard practices it's best to use online sites like Grammar Girl to help you along. Taking the advice of your editor can also help hone your punctuation skills. In the end, use your best judgment on punctuation, for your first instinct is normally the right one. However, if you use a comma to break up two dependent statements that start with subordinate clauses we will hunt you down. Punctuation can get a little tricky. The best advice I've heard about it: consistency. Good luck with the rest of the AtoZchallenge. Whew! You do mean business. Thanks for linking up Grammar Girl. Never realized there was such a debate over punctuation, but this might explain why so many authors don't use it. Remember the book on punctuation, "Eats, Shoots and Leaves"? I've always loved the cover images used for the various editions. A little humor when dealing with such an explosive subject helps, too. Journalists use the Associated Press Style Book for questions on punctuation; end of discussion as far as the news editor is concerned.